When files are being downloaded from the Internet or another location, Windows may set an attribute on the file to Blocked. When this happens, it may not load properly into the application. For example, if a non-standard EQuIS Report or Form is downloaded, it may be blocked. When the user attempts to use that report or form in EQuIS Professional Version 7, it may not show up in the list. 1.To download a file, save it to a known folder where the user has update permissions - e.g., the Downloads folder. 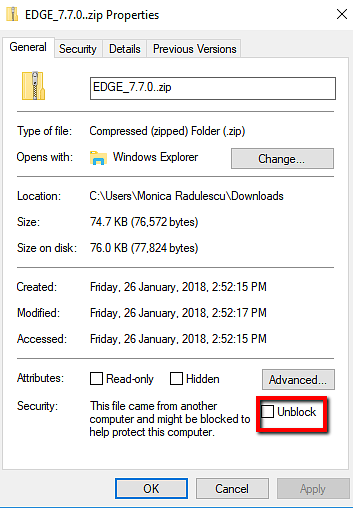 2.After downloading the file, check to see if it has been blocked by Windows by right-clicking on the downloaded file, and selecting Properties. A Properties dialog will be displayed which indicates the status of the file. 4.Click Unblock to remove this restriction on the file. Note: It is less work to unblock a .zip file than to unblock each of the individual files that are extracted from it. 5.Typically, these files will need to be moved into the Install folder - e.g. C:\Program Files\EarthSoft\EQuIS\... If an attempt is made to unblock after the file has been moved into the install location, it will likely remain blocked as Admin permissions are required on the file, and by default this will not occur, even if your user account is an Admin. 6.After the file has been unblocked, close and re-open the program that should be loading the file - e.g., EQuIS Professional. The file should now load, and the report or form made available.